RV users know that feeling. The one where you know that you’re forgetting something just as you are ready to depart on that anticipated road trip. 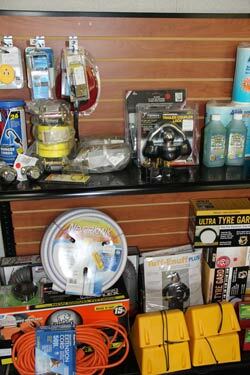 McBride’s RV storage customers love that there is an onsite RV & boat accessory store for those last minute items like, toilet chemicals, electrical adapters, sewer hoses and all the other necessities that you must have. McBride’s customers love that having this convenience saves them time and a lot unnecessary worrying like, “Oops we forgot to get ….” , making life less stressful. McBride’s carries a variety of important RV and boat items at the facility store. If something is not in stock, chances are, it’s in our other RV repair facility location just minutes away. If you need something specific for your boat, trailer, motorhome or any other vehicle that you’re storing at our facility, we can order it for you from our large 800 page catalog. This catalog covers anything you could imagine needed for your RV or boat. Having an onsite accessory store is just another great reason why everyone’s first choice is McBride’s RV storage. You should expect more from your RV storage provider. That’s why McBride’s is the leading RV storage facility in Southern California.